Picture if you can 7 million tulips, narcissi, hyacinths, and other bulbs blooming in unison under a mature canopy of 18th-century beech trees. 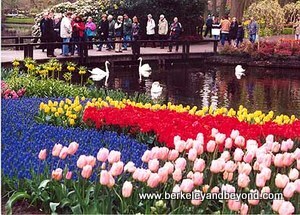 That is what visitors see at Keukenhof Gardens, located in Lisse about an hour outside of Amsterdam. Once the kitchen garden for a countess, it now is billed as the greatest flower show on earth and draws more than 700,000 visitors each year to stroll its trails and admire its blooms. Though it is open for eight weeks--from late March to late May--the best time to see full bloom is at the end of April and beginning of May. Basically an open-air flower bulb museum, Keukenhof has 10 miles (18 kilometers) of walking paths. Keukenhof could also be called a display garden for the bulb industry. Tulip bulbs are "loaned" each year to the garden by various growers, who are eager to show off their latest hybrids but also anxious not to have them fall into competitive hands. Add to this picture the fabulous annual mid-April Flower Parade of the Dutch Bulb District. Consisting of approximately twenty elaborate bloom-covered floats, each decorated with about 100,000 flowers, it is similar to California's Rose Parade in the U.S., except that this parade consists of floats covered with bulb flowers and is an all-day, on-going trek from one town to another. The gorgeous procession travels from Noordwijk, in the heart of the bulb fields, to Haarlem, about 24 miles (40 kilometers) away. And do allow time for a leisurely bike ride through brilliantly-colored fields of blooming tulips accented with sublimely fragrant hyacinths. Want to add this floral extravaganza to your own album of travel experiences? It is never too soon to start planning a visit for the next year. With a window of only about six weeks of prime bloom, you need to carefully organize your schedule to cram in this tulip-heavy itinerary. As you can see, all this tight timing makes a coordinated, all-inclusive package tour especially attractive. Some specialty tours add in extras like canal barge excursions and cheese-tasting. Keep in mind that every ten years the Dutch horticultural exhibition known as Floriade occurs in Haarlemmermeer. Since the last one was held in 2002, the next one will be in 2012. It is located an easy twenty-minute bus ride from the airport. If your stopover at Amsterdam's Schiphol Airport is four hours or longer, you have time. Bus service is free with an admission ticket for Floriade and can be arranged at the airport. The airport also has guided tours that assure your return in time for your flight. Of course, you'll want to bring bulbs home. Only problem is that when bulbs are blooming in Holland, it is the wrong time to purchase them. What you'll find available for sale then is old, inferior bulbs that won't give you a nice bloom. It is frustrating to see the gigantic amaryllis bulbs at Amsterdam's Floating Flower Market and know that you must not buy them, but it is less frustrating than buying them, tending them, and finding out they produce only leaves. If you are in Holland in the right season to buy good bulbs, keep in mind that to bring them through customs into the U.S. they must carry a certification. 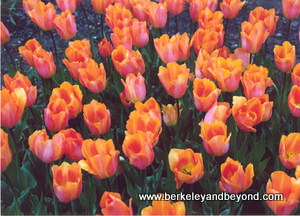 Bulbs must be dirt-free (to keep out infected soil). For quality, they should be heavy and firm like an onion. The bigger the bulb, the better the flower. The best thing to do is to make a shopping list as you tour the gardens, then arrange to have your favorite bulbs shipped to your home when they are ready. Alternatively, you can buy your bulbs from a reputable dealer in the U.S., specifying that you want the best Dutch bulbs. But no matter what you pay for a Dutch tulip bulb today, you're getting a good deal. There was a time hundreds of years ago when a coveted tulip bulb sold for the price of a house located on one of Amsterdam's better canals! But lucky you, you can see the spectacular show provided by the best of tulip evolution now for much, much less. When your trip is over, secure a window seat on your return flight so you can view the colorful flower fields from the air. It's a sight you won't soon stop sighing over.